A crying child unsure of what to make of Santa Claus in Shishmaref, Alaska. 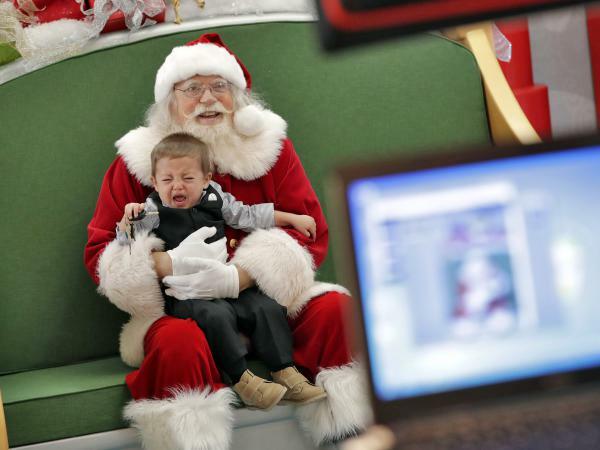 Children feel Santa's beard at a shopping mall in Santiago, Chile. 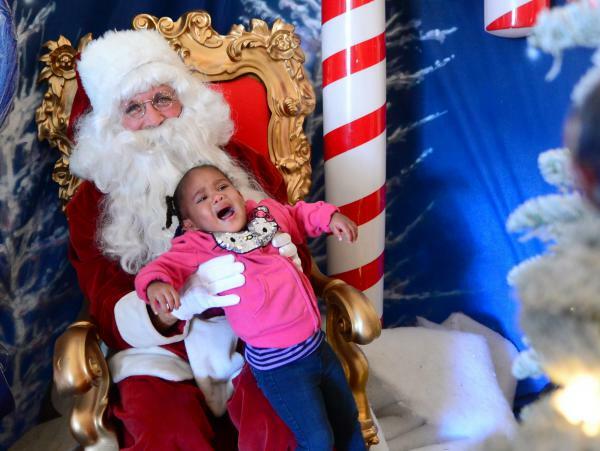 This toddler in Los Angeles cries for her mommy who placed her on Santa's lap. An unhappy child has his photo taken with Santa at the Chandler Mall, in Chandler, Ariz.
Now, in an effort to swap some of the experience's impulsiveness for efficiency: Santa is taking reservations at Macy's flagship store at New York City's Herald Square. That's the site of the 1947 classic, Miracle on 34th Street. The company says each year it receives around a quarter million visitors to "Macy's Santaland," its 13,000 square foot North Pole-like display there that runs through Christmas Eve. And it wants to speed Santa's guests along by barring walk-ins. Patrons can sign up online to get on Santa's calendar in half-hour time slots from as late as 30 minutes before the planned visit to as early as five days ahead. 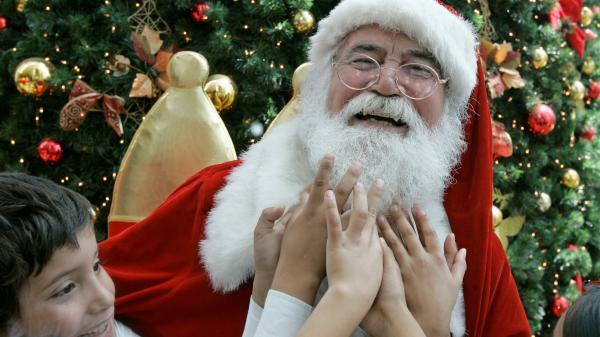 The wait to see Santa can stretch up to three hours during peak times, according to Macy's, which says it expects the new system will cut that time to less than an hour. The store Santa will see children for free, but a professional photo package of the visit begins at $20.99. "Santa's a popular guy, so the wait times to meet him have been quite long in previous years, especially on our busiest days," Macy's said on its web site. "The new reservation system is designed to minimize this by scheduling visitors to join the line at a time of your choice, allowing for the best possible holiday experience." But some social media users described the change as a Grinch-like move. And others complained of long wait times, even with reservations. "I believe, I believe," said young Susan (Natalie Wood) in Miracle on 34th Street. These days that Christmas spirit might just require an online booking first.